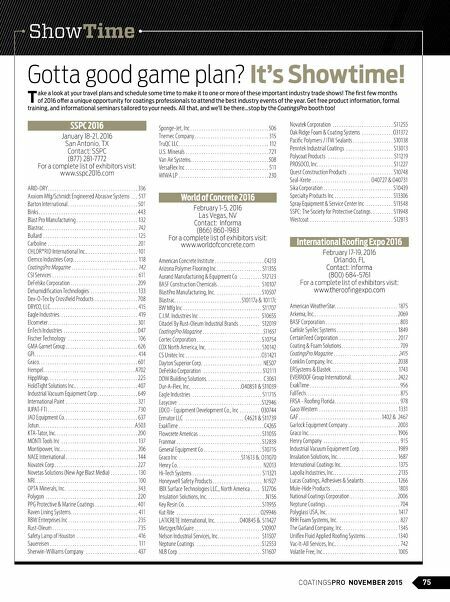 COATINGSPRO NOVEMBER 2015 75 ShowTime Sponge-Jet, Inc 506 Tnemec Company 315 TruQC LLC 112 U S Minerals 721 Van Air Systems 508 VersaFlex Inc 511 WIWA LP 230 World of Concrete 2016 February 1-5, 2016 Las Vegas, NV Contact: Informa (866) 860-1983 For a complete list of exhibitors visit: www.worldofconcrete.com American Concrete Institute C4213 Arizona Polymer Flooring Inc S11355 Aurand Manufacturing & Equipment Co S12123 BASF Construction Chemicals S10107 BlastPro Manufacturing, Inc S10507 Blastrac S10117a & 10117c BW Mfg Inc S11707 C I M Industries Inc S10655 Citadel By Rust-Oleum Industrial Brands S12019 CoatingsPro Magazine S11651 Cortec Corporation S10754 COX North America, Inc S10142 CS Unitec Inc O31421 Dayton Superior Corp NES07 DeFelsko Corporation S12111 DOW Building Solutions C3061 Dur-A-Flex, Inc O40851 & S11039 Eagle Industries S11715 Easycove S12946 EDCO - Equipment Development Co , Inc O30744 Ermator LLC C4621 & S11739 ExakTime C4265 Flowcrete Americas S11055 Franmar S12839 General Equipment Co S10715 Graco Inc S11613 & O31070 Henry Co N2013 Hi-Tech Systems S11321 Honeywell Safety Products N1927 IBIX Surface Technologies LLC , North America S12706 Insulation Solutions, Inc N156 Key Resin Co S11955 Kut Rite O29946 LATICRETE International, Inc O40845 & S11427 Metzger/McGuire S10907 Nelson Industrial Services, Inc S11507 Neptune Coatings S12553 NLB Corp S11607 SSPC 2016 January 18-21, 2016 San Antonio, TX Contact: SSPC (877) 281-7772 For a complete list of exhibitors visit: www.sspc2016.com ARID-DRY 336 Axxiom Mfg/Schmidt Engineered Abrasive Systems 517 Barton International 501 Binks 443 Blast Pro Manufacturing 132 Blastrac 742 Bullard 125 Carboline 201 CHLOR*RID International Inc 101 Clemco Industries Corp 118 CoatingsPro Magazine 142 CSI Services 611 DeFelsko Corporation 209 Dehumidifcation Technologies 133 Dex-O-Tex by Crossfeld Products 708 DRYCO, LLC 415 Eagle Industries 419 Elcometer 301 EnTech Industries 047 Fischer Technology 106 GMA Garnet Group 626 GPI 414 Graco 601 Hempel A702 HippWrap 225 HoldTight Solutions Inc 407 Industrial Vacuum Equipment Corp 649 International Paint 321 IUPAT-FTI 730 JAD Equipment Co 637 Jotun A503 KTA-Tator, Inc 200 MONTI Tools Inc 137 Montipower, Inc 206 NACE International 144 Novatek Corp 227 Novetas Solutions (New Age Blast Media) 130 NRI 100 OPTA Minerals, Inc 343 Polygon 220 PPG Protective & Marine Coatings 401 Raven Lining Systems 411 RBW Enterprises Inc 235 Rust-Oleum 735 Safety Lamp of Houston 416 Sauereisen 111 Sherwin-Williams Company 437 Novatek Corporation S11255 Oak Ridge Foam & Coating Systems O31372 Pacifc Polymers / ITW Sealants S10138 Penntek Industrial Coatings S13013 Polycoat Products S11219 PROSOCO, Inc S11227 Quest Construction Products S10748 Seal-Krete O40727 & O40731 Sika Corporation S10439 Specialty Products Inc S13306 Spray Equipment & Service Center Inc S11548 SSPC: The Society for Protective Coatings S11948 Westcoat S12813 International Roofing Expo 2016 February 17-19, 2016 Orlando, FL Contact: Informa (800) 684-5761 For a complete list of exhibitors visit: www.theroofingexpo.com American WeatherStar 1875 Arkema, Inc 2069 BASF Corporation 803 Carlisle SynTec Systems 1849 CertainTeed Corporation 2017 Coating & Foam Solutions 709 CoatingsPro Magazine 2415 Conklin Company, Inc 2038 ERSystems & Elastek 1743 EVERROOF Group International 2422 ExakTime 956 FallTech 875 FRSA - Roofng Florida 978 Gaco Western 1331 GAF 1402 & 2467 Garlock Equipment Company 2003 Graco Inc 1906 Henry Company 915 Industrial Vacuum Equipment Corp 1989 Insulation Solutions, Inc 1687 International Coatings Inc 1375 Lapolla Industries, Inc 2135 Lucas Coatings, Adhesives & Sealants 1266 Mule-Hide Products 1803 National Coatings Corporation 2006 Neptune Coatings 704 Polyglass USA, Inc 1417 RHH Foam Systems, Inc 827 The Garland Company, Inc 1345 Unifex Fluid Applied Roofng Systems 1340 Vac-It-All Services, Inc 742 Volatile Free, Inc 1005 T ake a look at your travel plans and schedule some time to make it to one or more of these important industry trade shows! 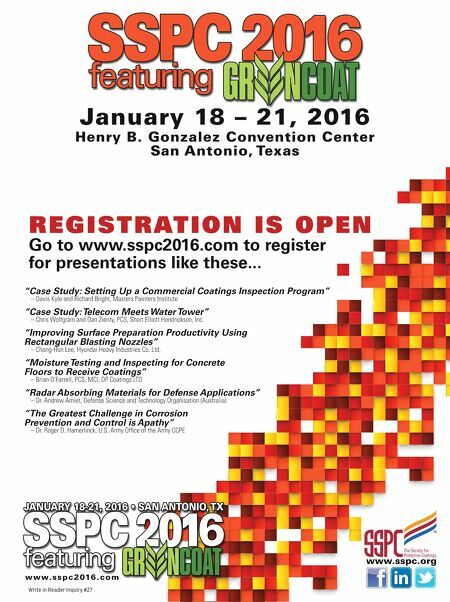 The frst few months of 2016 ofer a unique opportunity for coatings professionals to attend the best industry events of the year. Get free product information, formal training, and informational seminars tailored to your needs. All that, and we'll be there…stop by the CoatingsPro booth too! Gotta good game plan? It's Showtime!